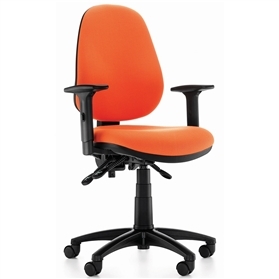 Komac Dot office chair Moulded CMHR foam is a standard feature on the Dot task chair. Permanent Contact Back Movement The available options include: Sliding seat (for seat depth adjustment) Selection of colours Choice of arms Pump-up lumbar. Height adjustable arms as standard.